We have a few things thriving in the aquaponics system, despite the heat. 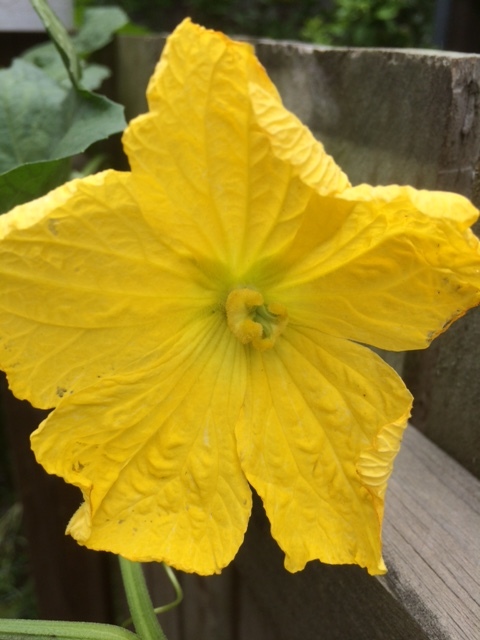 One noteworthy plant is a member of the gourd family—variously spelled loofah or luffa, this vine is producing the most delightful bright yellow flowers and most impressive ‘fruit’. A little Googling tells me that they are often referred to as dishcloth gourds or vegetable sponges. Ours has been grown from removing, sprouting and planting the seeds from a ‘fruit’ that Chris bought home some time last year. 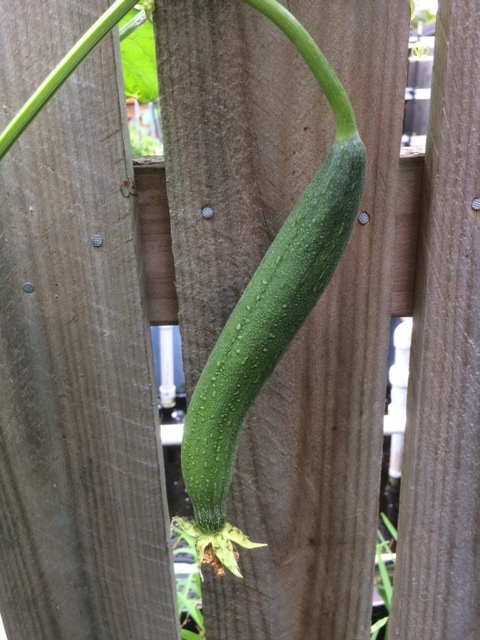 Our aquaponics store had given it to him as a gift, and while we had no idea to do with it, we (again) managed to Google and discover that it needed to be dried out, rinsed and squeezed out … and then the pesky seeds picked and rattled out. You then dry out the internal fibrous bit. I sliced ours into pieces and have used one piece for months now as a bath washcloth/sponge. It is incredibly robust and I like the idea of using a piece as a scourer in the kitchen to replace the typical plastics-based stuff that we usually buy and use. I know it is a small thing, but each bit of plastic used and then discarded ultimately ends up as landfill. And the loofah? Despite its inherent sturdiness, it is just vegetable fibre and will ultimately breakdown to something compostable. We are in the final weeks of summer here, although you would not know it as it is still overly hot. Large tracts of Australia have just experienced rolling heat waves—the most recent is just dissipating now, but not without setting record temperatures over 47 degrees (that’s 116 (ish) Fahrenheit) in a number of towns in NSW and Queensland. We have not seen decent rain in Woody Point for almost a month now, and so the soil garden is struggling, despite regular watering. I am so cranky with the World at the moment—particularly with politicians and the fact that the ‘leader of the free world’, AKA Donald Trump, is a fruitcake and our Prime Minister is an invertebrate. Climate change is real people and we need to engage with it. We CANNOT keep digging up and burning fossil fuels. Period. And if this recent spate of hot weather does not convince locals here, I don’t know what will. Tags: global warming, heat wave, loofah, luffa. Bookmark the permalink. The original inspiration—all the way from the US of A! We bought local organic honey and also used our own home-grown and dried turmeric! The girls getting used to the new feeding mechanism. Tiny signs of potential fruit on our finger lime—fingers crossed! Our citrus trees are starting to bear fruit! Our lovely corn about to be relished! Galangal all dug up, washed and now on drying racks…we will NEVER use this amount, so will have to find homes for it. Is there anything more beauteous than a zucchini flower? Strawberries in flower and fruit! My success! 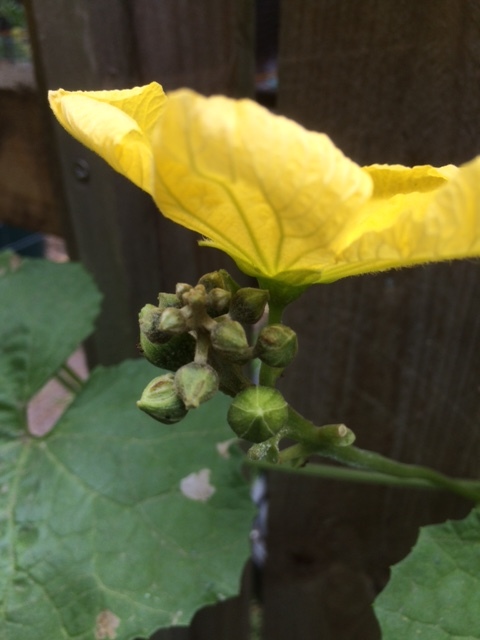 Spaghetti squash plant! The parsley patch—so much growth! Butter lettuces have a heart! Lettuces still up the wahoosie! Little handfuls of green jewels! The corn is sweet an juicy! Mini watermellon was a real treat! Nothing like a good dirty bath, hey Blanche?